This blog follows the buy-to-let market in Torbay. You’ll find tips, guidance, and analysis that relates specifically to Torbay and you’ll also find properties from all the estate agents in the town on here that may make decent investments. I operate Ridgewater Residential Lettings in Torbay and if you’re thinking of buying a property to let in Torbay, I’m happy to offer a second opinion. The mind-set and tactics you employ to buy your first Torbay buy to let property needs to be different to the tactics and methodology of buying a home for yourself to live in. The main difference is when purchasing your own property, you may well pay a little more to get the home you (and your family) want, and are less likely to compromise. When buying for your own use, it is only human nature you will want the best, so that quite often it is at the top end of your budget (because as my parents always used to tell me – you get what you pay for in this world!). Yet with a buy to let property, if your goal is a higher rental return – a higher price doesn’t always equate to higher monthly returns – in fact quite the opposite. Inexpensive Torbay properties can bring in bigger monthly returns. Most landlords use the phrase ‘yield’ instead of monthly return. To calculate the yield on a buy to let property one basically takes the monthly rent, multiplies it by 12 to get the annual rent and then divides it by the value of the property. This means, if one increases the value of the property using this calculation, the subsequent yield drops. Or to put it another way, if a Torbay buy to let landlord has the decision of two properties that create the same amount of monthly rent, the landlord can increase their rental yield by selecting the lower priced property. Now of course these are averages and there will always be properties outside the lower and upper ranges in yields: they are a fair representation of the gross yields you can expect in the Torbay area. However, before everyone in Torbay starts selling their upmarket properties and buying cheap ones, yield isn’t the only factor when deciding on what Torbay buy to let property to buy. Void periods (i.e. the time when there isn’t a tenant in the property between tenancies) are an important factor and those properties at the cheaper end of the rental spectrum can suffer higher void periods too. Apartments can also have service charges and ground rents that aren’t accounted for in these gross yields. Landlords can also make money if the value of the property goes up and for those Torbay landlords who are looking for capital growth, an altered investment strategy may be required. It is very much a balancing act of yield, capital growth and void periods when buying in Torbay. Every landlord’s investment strategy is unique to them. If you would like a fresh pair of eyes to look at your portfolio, be you a private landlord that doesn’t use a letting agent or a landlord that uses one of my competitors – then feel free to drop in and let’s have a chat. What have you got to lose? 30 minutes and my tea making skills are legendary! Back in the early 2000’s, between 1m and 1.3m people moved each year in England and Wales, peaking at 1,349,306 home-moves (i.e. house sales) in 2002. However, the credit crunch hit in 2008 and the number of house sales fell to 624,994 in 2009, although this has steadily recovered since then, albeit to 899,708 properties by 2016. This means there are around 450,000 fewer house sales (house-moves) each year compared to the noughties … but the question is … why are there fewer house sales? To answer that, we have to go back 40/50 years. Inflation was high in the late 1960’s, 70’s and early 80’s. To combat that, the Government set interest rates high to try to lower inflation. Higher interest rates meant the householders monthly mortgage payments were higher, meaning mortgages took a large proportion of the homeowner’s household budget. However, that wasn’t all bad news as the high inflation eroded the mortgage debt in ‘real spending power terms’. Consequently, as wages grew (to keep up with inflation), this allowed them to get an even higher mortgage (whilst their mortgage debt was decreasing) and therefore to move up the property ladder quicker. Roll the clock on to the late 1990’s and the early Noughties, and things had changed. UK interest rates tumbled as UK inflation dropped. Lower interest rates and low inflation, especially in the five years 2000 to 2005, meant we saw double digit growth in the value of UK property. This inevitably meant all the home owner’s equity grew exponentially, meaning people could continue to move up the property ladder (even without the effects of inflation). This snowball effect (of everyone moving house) continued into the mid noughties (2004 to 2007), as Banks and Building Society’s slackened their lending criteria (who can remember the 125% loan to value Northern Rock Mortgages that could be obtained with just a note from your Mum!! ) meaning home movers could borrow even more to move up the property ladder. You would think that with ultra-low interest rates at 0.25% (a 320+ year all time low), the the number of people moving would be booming – wouldn’t you ? However, with (1) low wage growth of 1.1% per annum, (2) the tougher mortgage rules since 2014 (3) sporadic property price growth in the last few years( and (4) high property values comparative to salaries (I talked about this a couple of months ago), all these four points have come together to mean less people are moving … but by how many? In 2007, 3,780 properties sold in the Torbay Council area and last year, in 2016 only 2,881 properties sold – a drop of 23.78%. Therefore, we have just over 900 less households moving in the Torquay and surrounding Council area each year. Now of that number, it is recognised throughout the property industry around fourth fifths of them are homeowners with a mortgage. That means there are around 737 mortgaged households a year (fourth fifths of the figure of 900) in the Torquay and surrounding council area that would have moved 10 years ago, but wont this year. There are around 265 households a year that aren’t moving due to a fall in the number of mortgaged owner occupiers (i.e. demographics). I then estimate another 103 households a year are of the older generation mortgaged owner occupiers. As they are increasingly getting older, older people don’t tend to move, regardless of what is happening to the property market (i.e. lifestyle). Then, I estimate 44 households of our Torquay (and surrounding area) annual non-movers will mirror the rising number of high equity owner occupiers, who previously would have moved with a mortgage but now move as cash buyers (i.e. high house price growth). Finally, and the majority of people that would have moved (but can’t). I believe there are 324 Torquay (and surrounding area) mortgaged homeowners that are unable to move because of the financing of the new mortgage or keeping within the new rules of mortgage affordability that came into play in 2014 (i.e. mortgage). Undoubtedly, whilst the first three points (demographics, lifestyle and high price growth) is something beyond Government or Bank of England control , it is the fourth point where something could be done, as it is the people and households in that final 4th point (the non-movers because of financing the new mortgage and keeping within the new rules of mortgage affordability) that if Torquay property values were lower, this would decrease the size of each step up the property ladder. This would mean the opportunity cost of increasing their mortgage would reduce (i.e. opportunity cost = the step up in their mortgage payments between their existing and future new mortgage) and they would be able to move to more upmarket properties. And then there is the mortgage rules, but before we all start demanding a relaxation in lending criteria for the banks, do we want to return to free and easy mortgages 125% Northern Rock footloose and fancy-free mortgage lending that seemed to be available in the mid 2000’s … available at a drop of hat and three tokens from a cereal packet? Jonathan Holmes, 34-year-old father of two from Torquay, was out house hunting. It was a pleasant August Saturday afternoon, and our man cycles along on his bike. He cycles up a street of suburban semis, where he spots a few retired mature neighbours, chatting to each other over the garden fence. He leans his bicycle against a lamppost and launches softly into his property search. Jonathan, like many Torquay people born in the late 1970’s to the early 1990’s, is keen to get a slice of prime Torquay real estate. Yet people like Jonathan in Generation Y (or the Millennials as some people call them i.e. born between 1977 and 1994 and needing family housing now) are discovering, as each year passes by, they are becoming more neglected and ignored when it comes to moving up the property ladder. However, the biggest drop has been in the 18 to 24-year old’s, where homeownership has dropped from a third (32%) in the 1980’s to less than one in ten (8.9%) today. Looking at the Torquay statistics, the numbers make even more interesting reading. So, what is my point? Well, all I would say to the homeowners of Torquay is that one solution could be to start to talk to your local councillors, so they can mould the planners’ thoughts and the local authority thinking in setting land aside for bungalows instead of two up two down starter homes? That would free the impasse at the top of the property ladder (i.e. 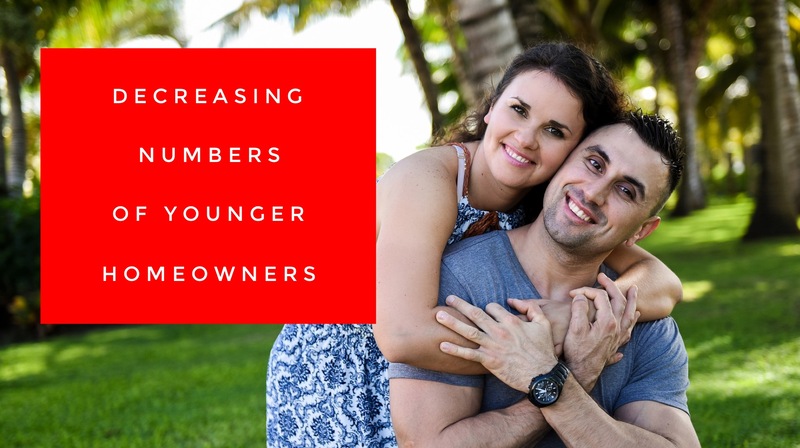 mature people living in big houses but unable to move anywhere), releasing the middle aged gridlocked people in the ladder to move up, thus releasing more existing starter homes for the younger generation. … and to you Jonathan … the wandering new home searcher – if things are going to change, it will be years before they do .. so keep going out and spreading the word of your search for a new home for your family. “What’s happening to the Torbay Property Market” is a question I am asked repeatedly. 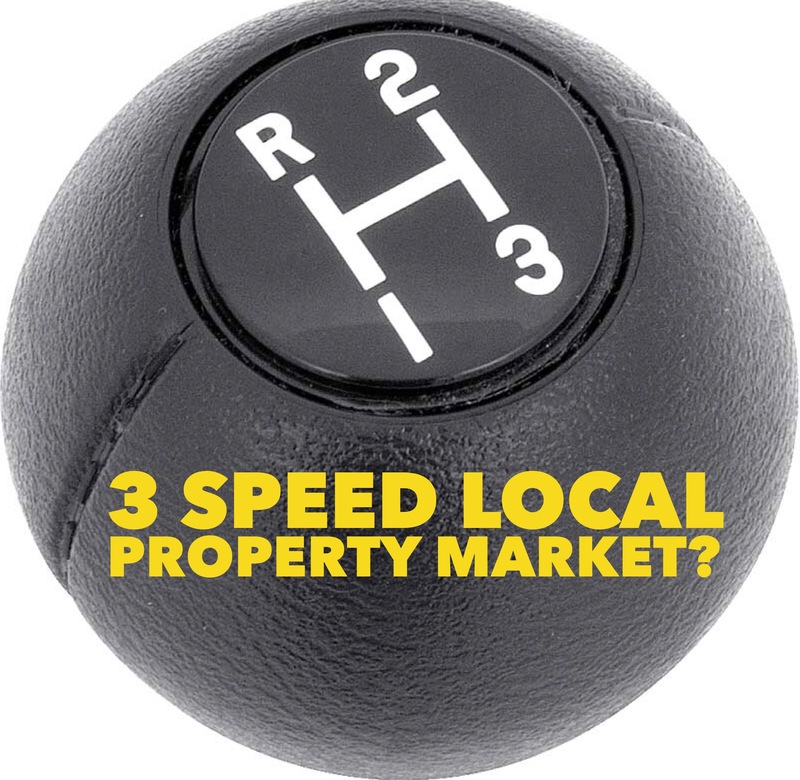 Well, would it be a surprise to hear that my own research suggests that there isn’t just one big Brixham property market – but many small micro-property markets? ‘lower to middle’ Torbay Property Market. 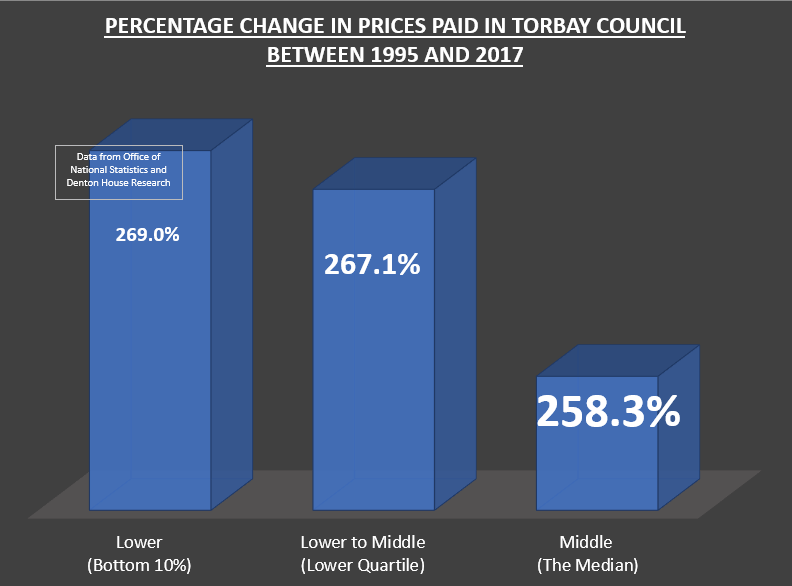 The ‘lower’ and ‘lower to middle’ sectors of the Torbay property market have been fuelled over the last few years by two sets of buyers. The first set, making up the clear majority of those buyers, are cash rich landlord investors who are throwing themselves into the Torbay property market to take advantage of alluringly low prices and even lower interest rates. The other set of buyers in the ‘lower’ and ‘lower to middle’ Torbay property market are the first-time buyers (FTB), although the FTB market is in a state of unparalleled deadlock as it’s been trampled into near-immobility and incapacity by the new 2014 stricter mortgage affordability regulations and also fewer mortgages with low deposits. …. and if one looks at the figures for Torbay Council area you can see the three different sectors (lower, lower/middle and middle) have performed quite differently. You might ask, what do all these different figures mean to homeowners and landlords alike? Quite a lot – so let me explain. The worst performing sector (with the lowest Percentage uplift) was the ‘middle’ housing market. Therefore, interestingly, if we applied the best percentage uplift figure (i.e. from the ‘lower’ market percentage uplift), to the ‘middle’ 1995 housing market figure, the 2017 figure of £206,649, would have been £212,789 instead. Now, I have specifically not mentioned the upper reaches of the Brixham housing market for several reasons. Firstly, the lower or middle market is where most of the buy to let investment landlords buy their property and where the majority of property transactions take place. 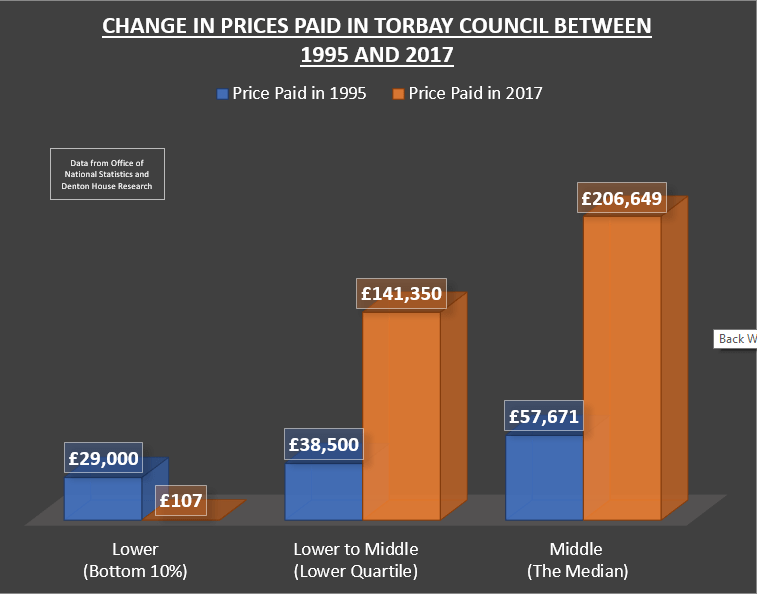 Secondly, due to the unique and distinctive nature of Torbay’s up-market property scene (because every property is different and they don’t tend to sell as often as the lower to middle market), it is much more difficult to calculate what changes have occurred to property prices in that part of the Torbay property market – looking at the stats for the up-market Brixham property market from Land Registry, only 24 properties in Brixham (and a 5 mile radius around it) have sold for £2,000,000 or more since 1997. So, what should every homeowner and buy to let landlord take from the information that there are many micro-property markets? Well, when you realise there isn’t just one Torbay Property Market, but many Torbay “micro-property markets”, you can spot trends and bag yourself some potential bargains. Even in this market, I have spotted a number of bargains over the last few months that I have shared in my Property Blog and to my landlord database, especially in the ‘lower’ and ‘lower/middle’ market. If you want to be kept informed of those buy to let bargains, have a look at my blog INSERT URL .. it’s free to do so and I’m sure you wouldn’t want to miss out – would you? I would love to know if you have spotted any micro-property markets in Torbay. One policy that comes to mind is Margaret Thatcher’s Council House sell off in the 1980’s, when around 1.4m council houses went from public ownership to private ownership. It was a great vote winner at the time (it helped her win three General Elections in a row) but it has meant the current generation of 20 somethings in Torbay (and elsewhere in the Country) don’t have that option of going into a council house. This has been a huge contributing factor in the rise of the private renting and buy to let in Torbay over the last 15 years. Looking at the numbers locally in Torbay and the surrounding area, it is obvious to me, that we as an area, are not pulling our weight either when it comes to building new homes. In the 12 months up to the end of Q1 2017, only 270 properties were built in the Torbay Borough Council area. Go back to 2007, that figure was 330, 10 years before that in 1997, 240 new homes and further back to 1988, 280 new homes were built. So, what does all this mean for the homeowners and landlords of Torquay, especially in relation to property prices moving forward? One vital bellwether of the property market (and property values) is the mortgage market. The UK mortgage market is worth £961,653,701,493 (that’s £961bn) and it representative of 13,314,512 mortgages (interestingly, the UK’s mortgage market is the largest in Europe in terms of amount lent per year and the total value of outstanding loans). Uncertainty causes banks to top lending – look what happened in the credit crunch and that seriously affects property prices. resulted in interest rates falling from 5% to 0.5%! Thankfully, after a period of stagnation, the Torquay property market started to recover slowly in 2011 as certainty returned to the economy as a whole and Torquay property values really took off in 2013 as the economy sped upwards. Thankfully, the ‘fire’ was taken out of the property market in Spring 2015 (otherwise we could have had another boom and bust scenario like we had in the 1960’s, 70’s and 80’s), with new mortgage lending rules. Throughout 2016, we saw a return to more realistic and stable medium term property price growth. Interestingly, property prices recovered in Torquay from the post Credit Crunch 2009 dip and are now 22.7% higher than they were in 2009.
been some aggressive competition among mortgage lenders, which has driven mortgage rates down to record lows. This is good news for Torquay homeowners and landlords, over the last few months a mortgage price war has broken out between lenders, with many slashing the rates on their deals to the lowest they have ever offered. For example, last month, HSBC launched a 1.69% five-year fixed mortgage! In the Torquay postcodes of TQ1 & TQ2, if you added up everyone’s mortgage, it would total £848,682,811! mortgage rate has gone from 31.52% in the autumn of 2012 to the current 59.3%. If you haven’t fixed – maybe you should follow the majority? In my modest opinion, especially if things do get a little rocky and uncertainty seeps back in the coming years (and nobody knows what will happen on that front), one thing I know is for certain, interest rates can only go one way from their 300 year ultra 0.25% low level … and that is why I consider it important to highlight this to all the homeowners and landlords of Torquay. Maybe, just maybe, you might want to consider taking some advice from a qualified mortgage adviser? There are plenty of them in Torquay. According to my research, of the 22,711 properties in Torquay, 8,755 of those properties have mortgages on them. 74.2% of those mortgaged properties are made up of owner-occupiers and the rest are buy to let landlords (with a mortgage). … but this is the concerning part .. 1,891 of those Torquay mortgages are interest only. My research also shows that, each year between 2017 and 2022, 23 of those households with interest only mortgages will mature, and of those, 6 households a year will either have a shortfall or no way of paying the mortgage off. Now that might not sound a lot – but it is still someone’s home that is potentially at risk. Historically plenty of Torquay homeowners bought an endowment policy to run alongside their interest only mortgage. However, because the endowment policy was a stock market linked investment plan and the stock market poorly performed between 1999 and 2003 (when the FTSE dropped 49.72%), the endowments of many of these homeowners didn’t cover the shortfall. Indeed, it left them significantly in debt! Torquay people who took out interest only mortgages years ago and don’t have a strategy to pay back the mortgage face a ticking time bomb. It would either be a choice of hastily scraping the money together to pay off their mortgage, selling their property or the possibility of repossession (which to be frank is a disturbing prospect). I want to stress to all existing and future homeowners who use mortgages to go in to them with your eyes open. You must understand, whilst the banks and building societies could do more to help, you too have personal responsibility in understanding what you are signing yourself up to. It’s not just the monthly repayments, but the whole picture in the short and long term. Many of you reading my blog ask why I say these things. I want to share my thoughts and opinions on the real issues affecting the Torquay property market, warts and all. If you want fluffy clouds and rose tinted glasses articles – then my articles are not for you. However, if you want someone to tell you the real story about the Torquay property market, be it good, bad or indifferent, then maybe you should start reading my blog regularly. Well last week’s article “The Unfairness of the Torquay Baby Boomer’s £2,270,920,000 windfall?” caused a stir. In it we looked at a young family member of mine who was arguing the case that Millennials (those born after 1985) were suffering on the back of the older generation in Torquay. They claimed the older generation had seen the benefit of the cumulative value of Torquay properties significantly increasing over the last 25/30 years (which I calculated at £2.27bn since 1990). In addition many of the older generation (the baby boomers) had fantastic pensions, which meant the younger generation were priced out of the Torquay housing market. Nonetheless, the majority of Millennials in the area still do rent from a landlord (4,600 Millennial households to be exact). Yet, they have a choice. Buckle down and do what their parents did and go without the nice things in life for a couple of years (i.e. the holidays, out on the town two times a week, the annual upgraded mobile phones, the £100 a month Satellite packages) and save for a 5% mortgage deposit … or live in a lovely rented house or apartment (because they are nowadays), without any maintenance bills and live a life with no intention of buying (because renting doesn’t have a stigma anymore like it did in the 1960’s/70’s (secretly hoping their parents don’t spend all their inheritance so they can buy a property later in life – like they do in central Europe). This disparity of wealth between the older and younger generations could have unparalleled consequences for the living standards of younger Millennials…. So Houston Torquay – do we have a problem?? Well Torquay Property News readers, you know I like a challenge. I can’t disagree with some of what the younger family member said, but there are always two sides to every story, so I thought I would do some homework on the matter .. Since 1990, the average value of a property in Torquay has risen from £65,000 to its current level of £235,400. As there are a total of 13,327 homeowners aged over 50 in Torquay; that means there has been a £2.27bn windfall for those Torquay homeowners fortunate enough to own their own homes during the property boom of the 1990s and early 2000’s. I must admit that the growth in property values in the 1990’s and 2000’s certainly helped many of Torquay’s baby boomers. 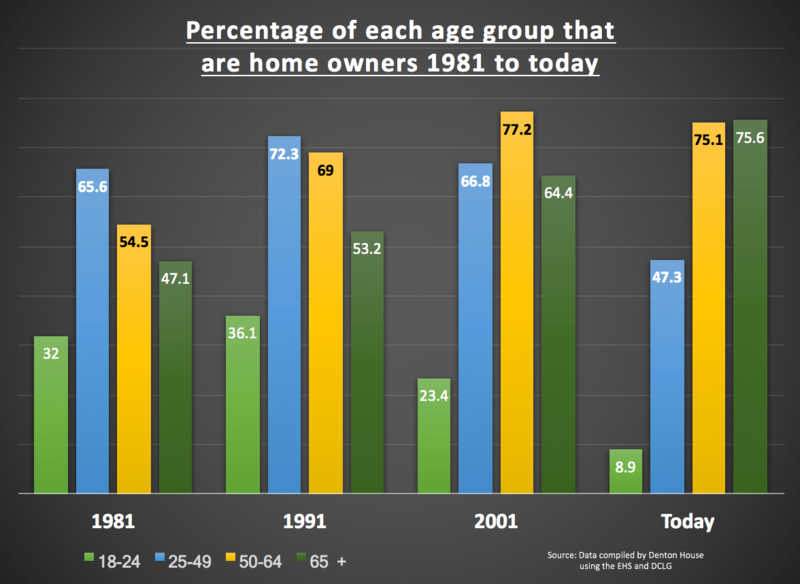 The figures do appear to put into reverse gear the perceived wisdom that each generation gets wealthier than the previous one … and so with all this wealth, the figures do back up the youngsters argument that Millennials are being priced out of home ownership. I received a very interesting letter the other day from a Brixham resident. He declared he was a Brixham homeowner, retired and mortgage free. He stated how unaffordable Brixham’s rising property prices were and that he worried how the younger generation of Brixham could ever afford to buy? He went on to ask if it was right for landlords to make money on the inability of others to buy property and if, by buying a buy to let property, Brixham landlords are denying the younger generation the ability to in fact buy their own home. Whilst doing my research for my many blog posts on the Brixham Property Market, I know that a third of 25 to 30 year olds still live at home. It’s no wonder people are kicking out against buy to let landlords; as they are the greedy bad people who are cashing in on a social woe. In fact, most people believe the high increases in Brixham’s (and the rest of the UK’s) house prices are the very reason owning a home is outside the grasp of these younger would-be property owners. Although, there are also indications of how un-affordable housing is, the house price-to-earnings ratio has almost doubled for first-time buyers in the past 30 years. In 1983, the average Brixham home cost a first-time buyer (or buyers in the case of joint mortgages) the equivalent of 3.2 times their total annual earnings, whilst today, that has escalated to 5.9 times their income (although let’s not forget, it was at 6.1 times their income for Brixham first time buyers in 2007). Again, those figures don’t tell the whole story. Back in 1983, the mortgage payments as percentage of mean take home pay for a Brixham first time buyer was 33.6%. In 1989, that had risen to 73.5%. Today, it’s 37.3% … and no that’s not a typo .. 37.3% is the correct figure. So, to answer the gentleman’s questions about the younger generation of Brixham being able to afford to buy and if it was right for landlords to make money on the inability of others to buy property? It isn’t all to do with affordability as the numbers show. Some say there is a tendency to equate property ownership with national prosperity, but this isn’t necessarily the case. The youngsters of Brixham are buying houses, but buying later in life. Also, many Brixham youngsters are actively choosing to rent for the long term, as it gives them flexibility – something our 21st Century society craves more than ever. Hi and thank you for visiting this blog. I have been in the Torbay Property market since 2008, owning and running with my excellent colleagues, the Ridgewater Lettings in St Marychurch, Torquay as well as Preston, Paignton. I have always shared my thoughts on the local property market in Torbay with my landlords, but now I want to share with everyone in the town. On this blog, I will talk about what is happening in the town’s property market itself, even looking at specific streets or housing estates. At other times, I will post what I consider decent buy to let deals. Some will be on the market with me (as I also sell property), but others will be on the market with other agents in Torbay. I like to look at the whole of market and give you, what I consider the best investment opportunities. If you see a potential deal, and want a second opinion, without hesitation, email the Rightmove link to [email protected] . I will always give you my honest opinion on the property and its investment potential. (both good and bad) .